According to The History of New Orleans, Volume 3 By John Smith Kendall this deluxe tugboat was named for Robert W. Wilmot who was born in Pittsburgh, PA in 1858. After his father's death in 1898 he took over the prominent coal company W.G. Wilmot Company in New Orleans. Blogger's Note: To celebrate our 100th Albany Woodworks News & Events Blog Post, we look 100 years into our past with 'This Day In New Orleans History.' We visit the pages of the New Orleans Herald for the headlines of the day. Published on Thursdays in eight to fourteen pages, the Herald served Algiers, a neighborhood of New Orleans located on the Westbank opposite the French Quarter on the Mississippi River, and the Central Business District, from 1905-1953. 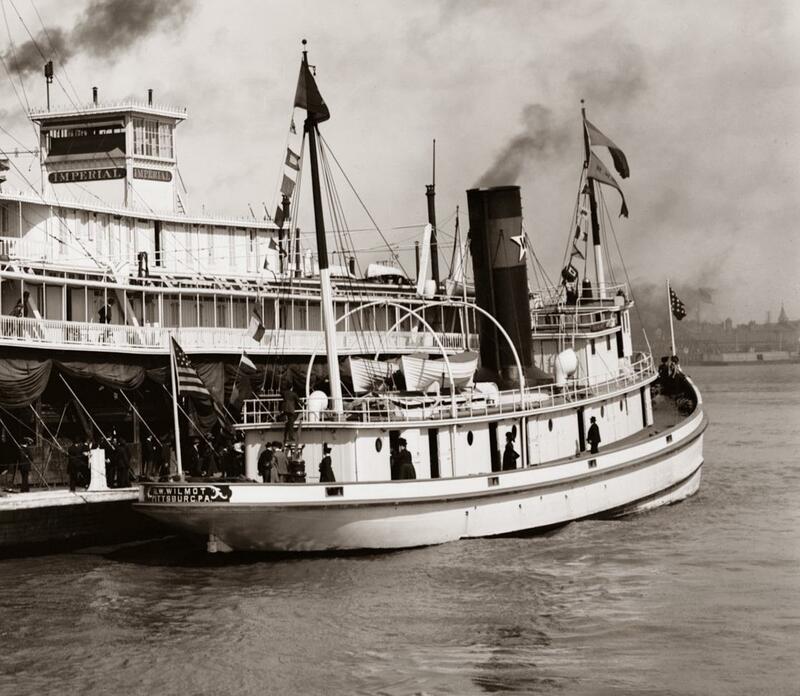 The POTOMAC spent her early days as the Tugboat ROBERT W. WILMOT, in service to the W. G. Wilmot Coal Company of New Orleans, before being sold to the military for the Spanish-American war effort. "Naval Tug POTOMAC had been the R. W. WILMOT. The reported abandonment (Blogger's Note: Reports of the POTOMAC's abandonment due to ice reached the New York Naval Yard on February 14, 1914, a few days prior to this article) of the United States naval tug POTOMAC in the ice floes of the Gulf of St. Lawrence marks, perhaps, the final chapter in the eventful career of the former New Orleans tug ROBERT W. WILMOT. An Associated Press dispatch received here Monday from St. John, N.F., states that the Potomac is held fast in ice, and was abandoned Saturday night by the thirty-six officers and men of her crew. This powerful tug was sold to the United States government during the Spanish-American war by the W. G. Wilmot Coal Company of New Orleans, for which company it was built, and during its sixteen years of history as a naval tug participated in numerous thrilling rescues of life and vessels at sea, and had braved the dangerous ice coasts of the far north and south almost to Cape Horn. Shortly after being sold to the government, and rechristened, the Potomac was assigned to the Atlantic fleet off Cuba, and salvaged the Spanish steamer Sandoval, and assisted in saving and towing to American docks a number of other Spanish vessels captured or disabled in the battle off Santiago, Cuba. The Potomac assisted in towing the world's largest floating dry dock, the Dewey, from Sparrows Point, Md., to Manila, having taken the dry dock as far as the Suez Canal. The POTOMAC also had the distinction of being the first relief vessel to reach Martinique after the great earthquake disaster a few years ago (Blogger Note: Author may be referring to the 7.9 Martinique Earthquake, December 3, 1906). The former ROBERT W. WILMOT was rechristened as the USS POTOMAC in service to the United States Navy for many years before being decommissioned in 1922. The POTOMAC was of steel construction and finished in expensive mahogany and sycamore. It had triple-expansion engines, capable of developing 2000-horse power, and at the time of construction, in 1897, was the most powerful tug in the world. It was sold to the United States navy for $125,000." Blogger's Note: The POTOMAC left Newport, Rhode Island on January 28, 1914 to rescue vessels icebound off Newfoundland. The POTOMAC was herself iced-in and abandoned on 14 February, but would ultimately survive her icy fate. Salvaged in the late spring, once the ice had thawed, and arriving to the New York Navy Yard in early June, where she received updating and repair. The POTOMAC returned to the Atlantic Fleet for the remainder of her military service, spending time in the Panama Canal Zone. Decommissioned on June 26, 1922 she was struck from the Naval Vessel Register on July 31st and sold for civilian service to the New Orleans & Bisso Towboat Company on December 1st of that same year. Tugboat, BELAMAR on the Southwest Pass of the Mississippi River at Burrwood, Louisiana near the mouth of the Delta. Burrwood was established and maintained by the Army Corps of Engineers to serve as a base for dredging operations, jetty work, and other activities required to maintain navigable conditions along this channel. Due to coastal erosion the community was finally abandoned. Detail from the upper right hand quadrant of a 1906 photo of Captain Cooley's steamboat AMERICA (center) with the tugboat SAMSON on the left and an unidentified tugboat on the right. 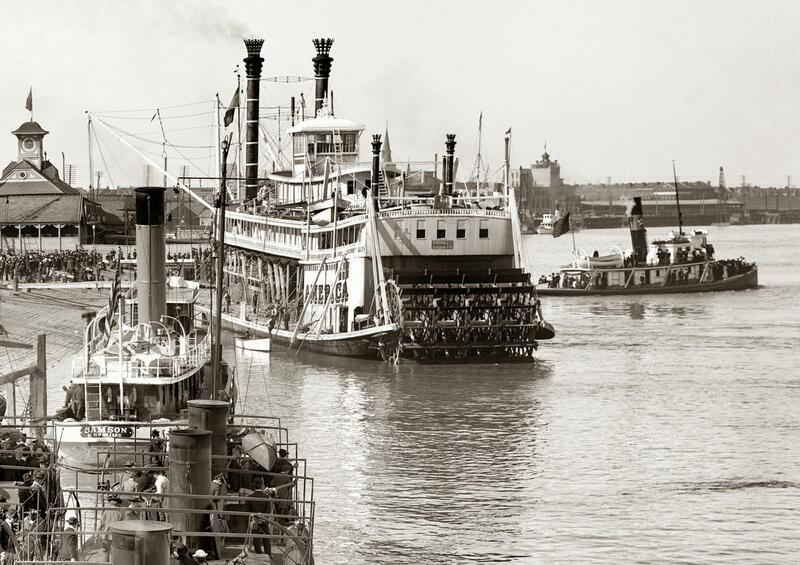 "The Inner Harbor Navigation Canal (the Industrial Canal), completed in April 1921, was the realization of the age-old dream of connecting the Mississippi River with Lake Pontchartrain. Built at a cost of $19 million, it provided industrial sites on deep water. It was dedicated May 5, 1921. On February 6, 1923, the tugboat SAMSON chugged from the foot of Canal Street to the Industrial Canal lock. The water was then lowered six feet from the level of the river to the level of the lake, which took ten minutes. Governor Parker, Mayor Andrew McShane, and Dock Board officials were aboard the SAMSON." Renamed NORMAN R. in 1937. La Crosse photo. Originally owned by Brown's Line coal operators in Pittsburgh. Named for Captain Mike Dougherty. 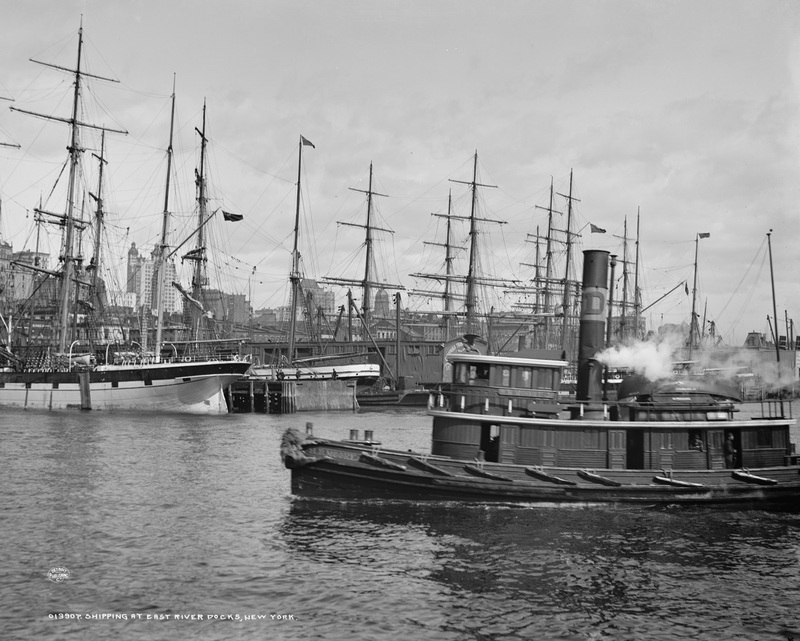 The tugboat did harbor work at Brown's Landing and then went into the Combine in 1900. Sold to the Nugent Sand Company and renamed TERRA in July 1930. 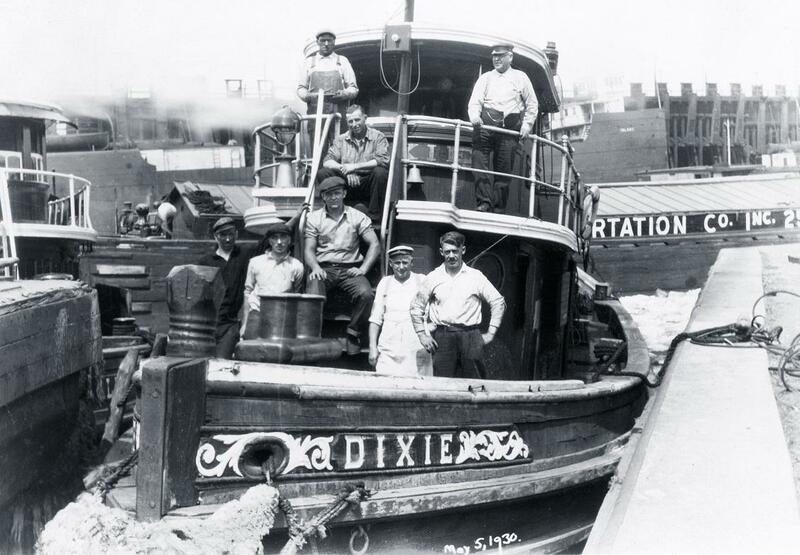 The Tugboat DIXIE photographed on the 5th of May, 1930 in an unknown port. Could have been in the Northwest at Seattle or in a port on the East Coast. Captain (upper right) and 7 crew members. The gents in the upper left and lower left may have worked in the engine room. The fellow lower right in the white cap appears to be wearing a white apron so he may have been the cook. 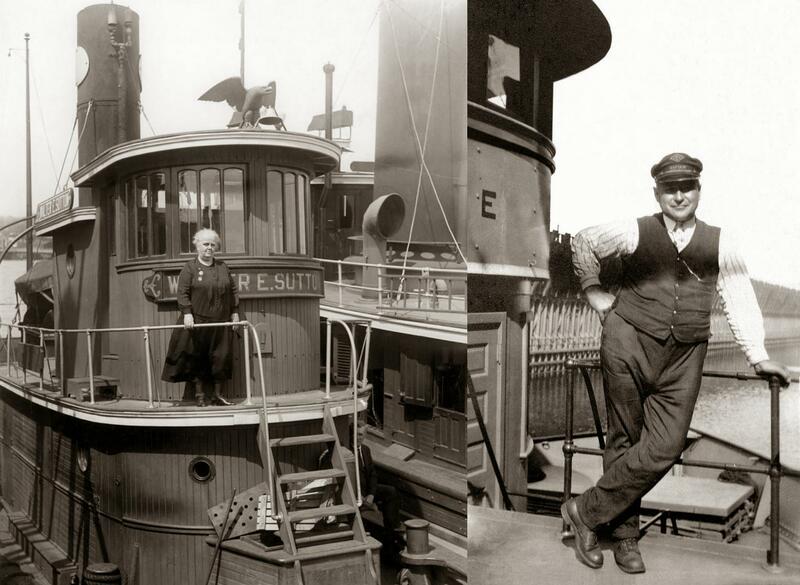 First photo above is of Kate Sutton, owner and manager of the Providence Steamboat Company in Rhode Island on board the tugboat WALTER E. SUTTON. When asked if she was the inspiration for the fictional character "Tugboat Annie," Kate reportedly said "I hope not!" Photo courtesy of Providence Steamboat Company collection, Steamship Historical Society Archives, www.sshsa.org. The photo of Kate came from a wonderful article on possible real life candidates for the title character in the 1933 MGM movie TUGBOAT ANNIE starring Marie Dressler and Wallace Beery that was filmed on Puget Sound in Washington state. The movie was based on several early short stories by Canadian writer Norman Reilly Raine that were published in The Saturday Evening Post. Raine wrote 75 ANNIE stories in all, the first was published in July, 1931. The second photo is of an unknown tugboat Captain that I bought on ETSY recently. The last 2 letters in the tugboats name on the pilot house were T E and there is a diamond shaped insignia on the Captain's cap. These items may provide clues to identify this tugboat and possibly even the Captain himself. His uniform is in much the same style of officers on river steamboat. 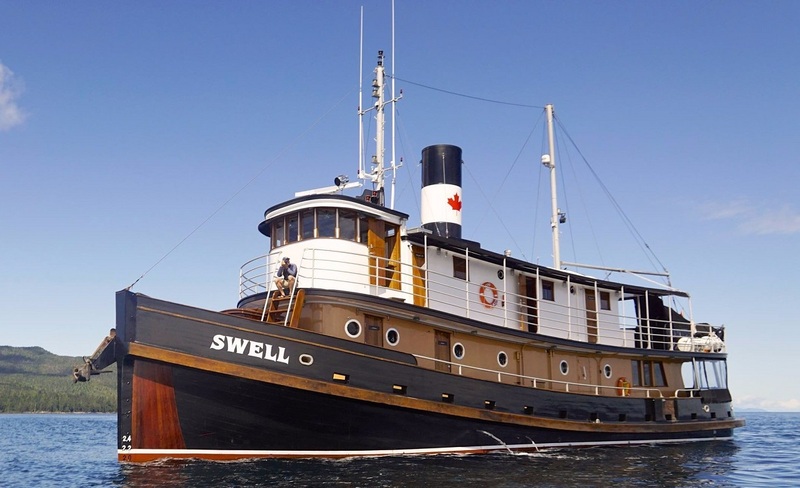 Watch our tour and review of Maple Leaf Adventures' MV SWELL, a modernized passenger tugboat originally built in 1912, including Sitka Spruce accommodations with private ensuite; activities: open wheelhouse, anchor chain, top deck lounge, hot tub, aft deck lounge, salon, games, library, wraparound decks, wildlife viewing of humpback whales and orca whales, and fishing; dining: salon, breakfast, lunch, dinner, snacks and drinks; expeditions: kayaking, pontoon boat cruising, more wildlife viewing of clams, crabs, seaweeds, starfish, jellyfish, oyster catchers, bald eagles, sea lions and deer, abandoned whaling station, Haida Gwaii watchmen sites, trees, longhouses, totem poles and scenery at sea and in the forest. "The Lackawanna Railroad tug CORNING is shown here getting cinder and ash vacuumed from her ash pit. A modified rail car is used to collect the debris. 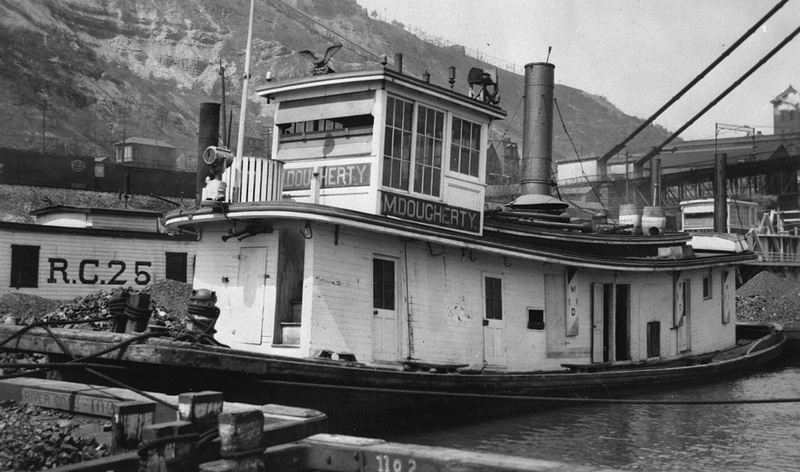 The day-to-day care of a coal-fired steam tug such as the CORNING was a costly and time-consuming business. Coal had to be loaded and ash removed every few days. Water was required every day, and stoking the boilers required the constant labor of at least one man. Husbandry of the engine itself required another set of engineers and oilers. Conversion from coal to oil-fired steam reduced crew, labor, and expense considerably; but the advent of the diesel engine interrupted the move toward better efficiency in steam power." Keeping It Alive for the Next Generation! "I think the future of the 'Foss' lies in education and getting kids out. It would be great to see the 'Foss' sailing or motoring again." (Christine Jacobson, Shipwright). 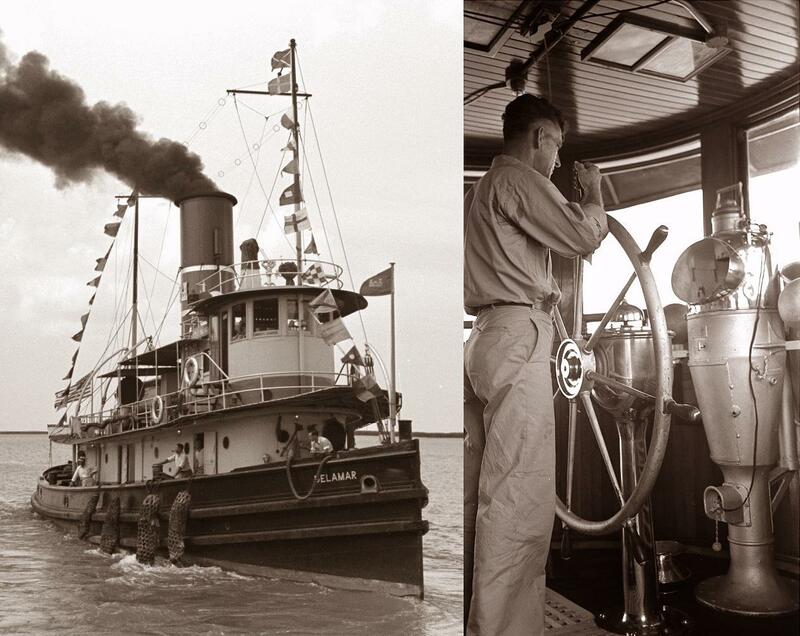 Northwest Seaport celebrates the 125th anniversary of tugboat Arthur Foss, a National Historic Landmark, in 2014. In collaboration with the Art Institute of Seattle's Summer Studio Class-2013, Northwest Seaport co-produced this film. Arthur Foss was built in 1889 as the "Wallowa" to tow sailing ships across the Columbia Bar off Oregon's coast. During the Klondike Gold Rush, it also towed ships and barges to Alaska and eventually came to Washington State's Puget Sound as a logging tugboat. As a Foss Launch & Tug Company tugboat, Arthur Foss gained distinction as the star of the 1934 MGM movie "Tugboat Annie," as one of the most powerful tugboats on the West Coast, and the last vessel to escape Wake Island before the Japanese invasion in WWII. Today, the 112 foot-long tugboat continues its career as a museum ship which is open to the public in Seattle for public programs, such as tugboat overnights & sleepovers, school tours, workforce development, dockside events and Tugboat Storytime. Welcome Aboard! Learn more at Northwest Seaport's website. 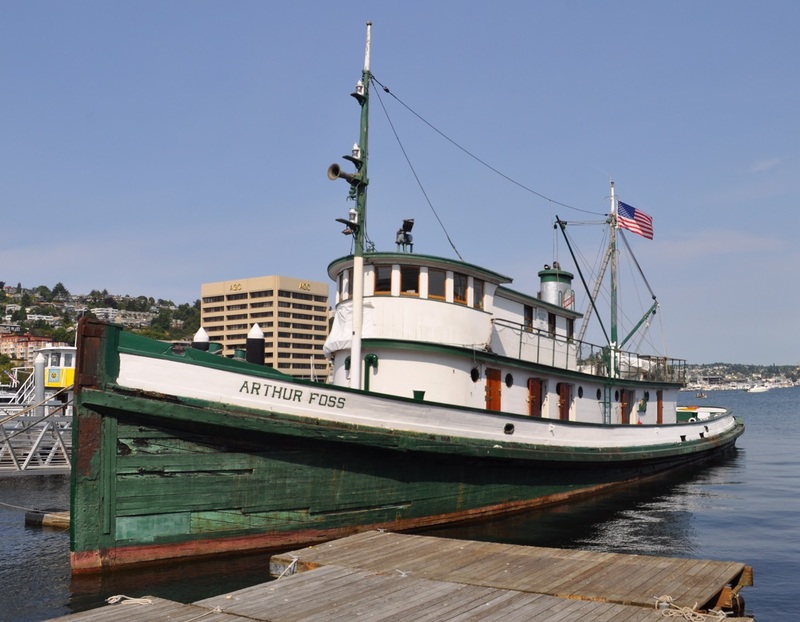 Please, donate to the Tugboat Arthur Foss Campaign or become a Northwest Seaport member, sponsor or volunteer. The documentary was directed by AIS-student Victor M. Ramos III. Gratitude to filmmaker Vaun Raymond, for this partnership and film would not have been made possible without your dedication and support. Built in 1896, by A.C. Brown and Son of Tottenville, New York as the H.B. Moore Jr. for Sivert J. Kron of New York, New York. The tug was later acquired by the Canal-Lakes Towing Company of New York, New York. Where she was renamed as the Calatco No. 4. In 1947, she was acquired by the McAllister Brothers Towing Company of New York, New York. Where the tug was renamed as the Dorothy McAllister. In 1958, the tug went out of documentation. Her current and or final disposition is unknown. She was a single screw tug, rated at 210 horsepower. Vessel Name: H.B. 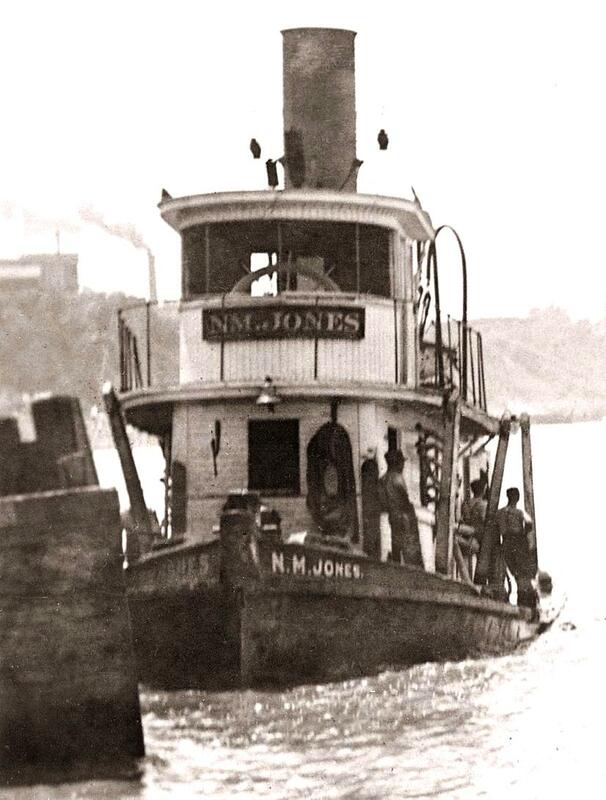 MOORE JR.
Sivert J. Kron, Canal-Lakes Towing Co., McAllister Bros. Towing Co.
Tugboat H.B. Moore Jr. foreground.